Farmers often don’t have an easy time getting access to capital to sustain and grow their businesses. Capay Organic, an organic family farm based about 35 miles west of Sacramento, California, faced just this dilemma in 2009. To deal with their cash flow issues, owners Noah Barnes and Thaddeus and Freeman Barsotti took matters into their own hands creating their own lending system, the Green Loan Program. The family’s do-it-yourself approach to financing shouldn’t come as a surprise. The three brothers come from a family of mavericks with deep roots in California’s organic gardening movement. Their parents, Kathleen Barsotti and Martin Barnes, founded the organic farm back in 1976 on 20 acres in Yolo County’s Capay Valley and helped establish a farmers’ market in the nearby city of Davis. 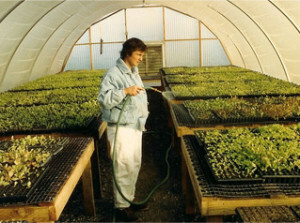 Barsotti was an early participant in the community-supported agriculture movement too, launching Capay’s CSA, Farm Fresh To You, in 1992. Today, the farm is flourishing. Last year Capay Organic took in about $40 million in total revenue, and it currently employs about 500 workers. Crops are grown on 1,000 acres of land split between Capay Valley and another site in Southern California’s Imperial Valley, located about 150 miles east of San Diego. Produce is USDA-certified organic and cultivated according to sustainable farming methods like crop-rotation, renewable fertilizers and a non-pesticide approach to pest management. The result of this mindful sowing and tilling is an abundance of different crops, more than 100 kinds of fruits and vegetables, including several types of melons, squash and figs and around 15 varieties of tomatoes. After being harvested, the produce makes its way to regional farmers markets and retail outlets as well as around 70,000 CSA customers in Northern and Southern California. Back in the late 2000s, however, the farm’s owners were running into a brick wall trying to raise capital in the wake of the U.S. housing market crash. “The great recession was going on, and banks were extremely risk averse,” Co-owner Noah Barnes tells Seedstock. Left without many other alternatives, the farm turned to their CSA customers. Capay’s Green Loan Program is 100 percent supported by its CSA customers. It’s a direct public offering through the state of California that’s only available to state residents. The loan has a ten-year maturity and pays a fixed annual 3.583% rate in produce or a fixed annual 2.083% rate in cash. The interest rate is fixed every Dec. 31 for the upcoming year based the current one year LIBOR rate, an average interest rate banks charge other banks for loans. Green Loan participants can invest anywhere between $2,000 to $50,000. Upon request, their investments can be refunded within 60 days. Capay keeps its CSA customers informed about the program through newsletters. Green Loan currently has about 200 active lenders, and it’s raised about a million dollars since it was launched. Capay isn’t the only food-oriented business to take advantage of California’s DPO rules. Annie’s Homegrown, a Berkeley company that makes organic pastas, the Arroyo Food grocery cooperative in Pasadena and People’s Community Market in Oakland have also used the strategy to generate capital. ImPact Farm, an aquaponic urban farm in South Los Angeles also wants to use DPO money to get up and running. Although Capay has brought in a substantial amount of money this way with its Green Loan Program, Barnes admits that it’s a “fairly expensive” way to raise funds. Establishing the program required getting a license from the state and working with an attorney, and keeping it going has meant hiring staff to manage accounts and deal with issuing yearly tax paperwork to investors. Still, despite these costs, Barnes says the program been beneficial for both the farm and CSA members.